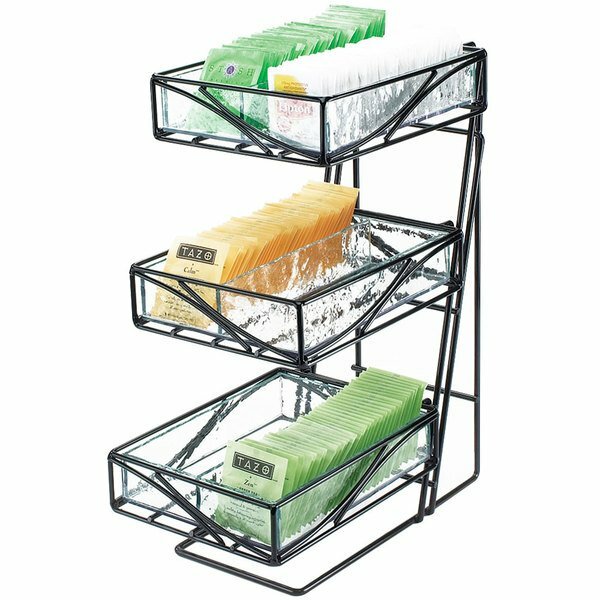 For an all-purpose solution to your beverage display needs, use this Cal-Mil 1235-TEA black wire display condiment organizer. Three large acrylic bins, each with a lengthwise divider, rest in a vertically-designed modern wire frame that's perfect for holding and organizing various tea bags at your cafe, buffet, or catered event. Its bold black color is accented by the classic green acrylic glass of the inner bins which serve to offer packets of tea, sugar, artificial sweetener, lemon, hot chocolate, and much more! This product can expose you to chemicals including acetaldehyde, which are known to the State of California to cause cancer, birth defects, or other reproductive harm. For more information, go to www.p65warnings.ca.gov. WARNING: This product can expose you to chemicals including acetaldehyde, which are known to the State of California to cause cancer, birth defects, or other reproductive harm. For more information, go to www.p65warnings.ca.gov. The wire display is very sturdy to my surprise. The Faux glass looks just like glass. The only flaw to the stand is where the seams of the glass are connected; some areas are not completely touching. Although the faux glass drawer seems to be sturdy. If you want a nice way to organize any little items, give this a shot. I use these racks to organize jams and jellies. We are a resort style senior living community so keeping the different flavors separate (and labeled) is very important to some of our residents who are visually impaired. I use this in my home to organize my tea bags. Its very convenient to have when organizing things as well as to have when quests come to the house. Works great to hold condiments for our coffee and tea station. We have a smaller one but needed something larger to accomodate heaveier use. It cleans easy and displays nicely.